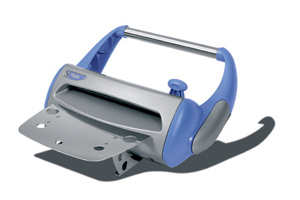 The Sigiflash is a compact reliable unit that seals 250mm x 10mm with an inbuilt cutter. It is also wall mountable. 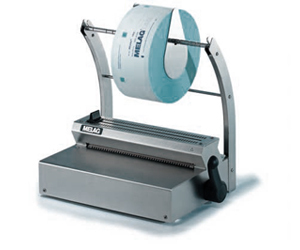 A fully integrated sealer that seals and cuts in 2.5 seconds. The MELAseal 100 is a quality German engineered product. It is easy to use forming a quality 10mm seal. This unit is available with a optional standard, hanging or wall mounted dispenser. The MELAseal 100 has a warm up time of 2 minutes. 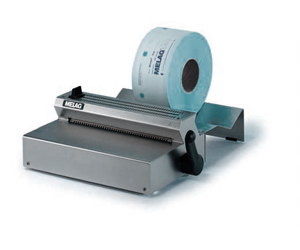 A fully integrated sealer that seals and cuts in 2.5 seconds. 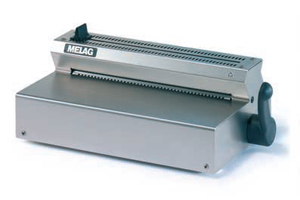 The MELAseal 100 is a quality German engineered product. It is easy to use formin a quality 10mm seal. This unit is available with a optional standard, hanging or wall mounted dispenser. The MELAseal 101 requires no warm up time. The M110 standard dispenser can be used with the MELAseal 100 or 101 models (pictured left). The pouch rolls sit in recessed plate to allow feed into the heat sealing machine. The M110 Hanging dispenser can be used with the MELAseal 100 or 101 models (pictured left). The pouch rolls hang above the unit and allow seamless feed into the heat sealing machine.